SOUTH BEND, Ind. — How does it feel to be a three-time champion? “Somewhat surreal,” said Atlanta Fire Elite head coach Curtis Morrison, all smiles with his team’s medal still around his neck, after a 2-1 win in the 1A title game at the 2019 Chipotle-USA Hockey Youth Tier II 14U National Championship. 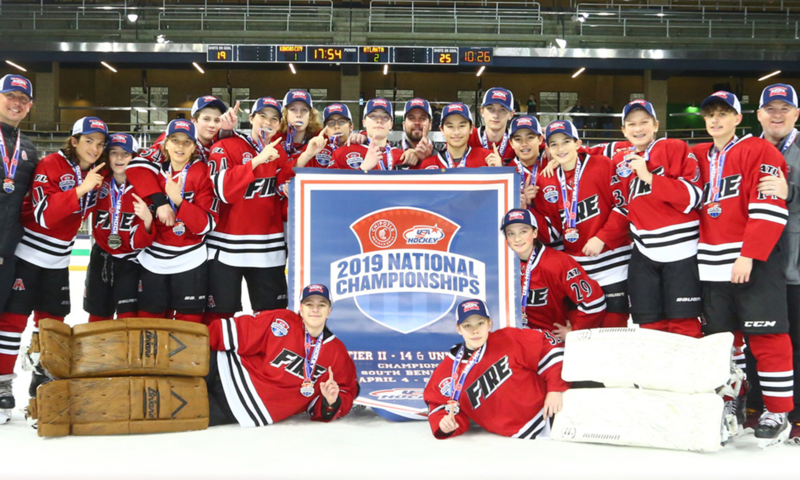 The Fire, who were undefeated in pool play and won all but one game in regulation time, were early favorites in the tournament, thanks to their collection of fast-skating, high-scoring forwards and, of course, their reputation as repeat winners at nationals. Atlanta, who rotated between two goalies for the tournament, gave their final game to Mitchell McCusker, who registered shutouts in his two prior appearances. McCusker ultimately made 18 saves on 19 shots to secure the win for his team over the KC Mavs. His play in net was instrumental during the first two periods, where the Mavs held strong at limiting chances at their own net while tilting the ice the other way. McCusker’s play gave the Fire time to calm their nerves and start playing better with the puck. “We weren’t really as sharp as we could have been,” Morrison said. The Fire struggled at times with puck management throughout the first period, with several miscues by players on positioning and passing. After a scoreless first period, the Mavs struck in the second, taking advantage of their second power play of the game. With the puck cycling back to the blue line, Mavs defenseman Zachary Whitaker unleashed a shot that McCusker had no real chance to stop. The goal against brought some life to Atlanta’s play and they responded with urgency. The Fire got on the board about three minutes after Whitaker’s power-play goal. Play originated behind the Mavs’ net, with Atlanta defenseman Zach Rizzo sending a puck out to the front of the net. Forward Hudson Orgeron collected the puck and poked it through several bodies clogging up the front of the net, resulting in the tying goal. From there, Atlanta largely controlled play for the rest of the game. The Mavs took five penalties over the course of the period, and while they often did a good job at blocking shots and closing off shooting lanes, Atlanta eventually found a way to break through. While the Mavs had several good chances to tie the game again, ultimately they were not able to convert, allowing the Fire to mob McCusker at the final horn. Three straight championships is a monumental achievement for the Fire, who are reinforcing the fact that hockey has a home in the south. Five players returned to the team from last year’s championship group and Morrison counted on them to lead the team through this year’s competition. “The way the game’s trending now, non-traditional markets are turning out great hockey players,” Morrison said. He has high hopes that players from his program will go on to play junior and college hockey, and with a history of winning already under their belts, the boys are well-positioned not only for future success, but to help prove wrong anyone who doubts the viability of the southern United States as a viable home for hockey.